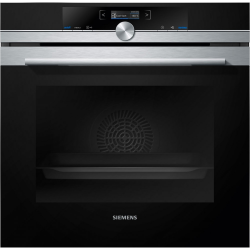 The HB632GBS1B Stainless Steel Single Oven from Siemens offers a large number of functions and features, all of which are especially designed to make your life wonderful and easy. Simplicity is the key in this day and age, something which Siemens boasts as a major factor in their appliances. This beautifully designed multi function oven sports 8 unique cooking options, adding that extra bit of variety into every meal. All of this is controlled from the large, high quality, full colour TFT display; forget old fashioned LED lights, this is the way of the future. Never be concerned about slamming the oven door shut ever again with the aid of softMove, an innovative technology which enables and soft and smooth close every time. If all that wasn’t enough then coolStart will gain your interest for sure. The idea behind this feature is that you never need to preheat the oven, and merely need to set the heat desired and the cooking time. Put your food items into the oven and it will automatically bring itself up to temperature and adjust cooking time accordingly. It’s a simple concept, but one which saves a huge amount of valuable time allowing you to put your concentration elsewhere.